Now I am a little late but I have been really busy with work and trying to catch up with my blogs. I slacked off while moving and haven't been able to catch up since. I am down to 200 to look at now I think.... I will say that if you have a pass code to post on your blog I probably don't reply because it's a pain to do on my phone. Now onto the important part the stitching. I will start with Afternoon Tea. I have been busy with this one though it is never the main focus. I am spanning 2 pages here so I am not sure how long this is going to take but I love working on it even though it's a LOT of black! Starting to fill in the leaf just to get away from black for a while. I'm getting down to the final motifs which is getting very exciting ... I will have to get the thread for baroque ready to go soon... maybe a finish sometime in September? And here is a close up of the section I have been working on recently. My count is off somewhere but I really don't care because the nature of this sampler means they fit just a little closer it's not critical. 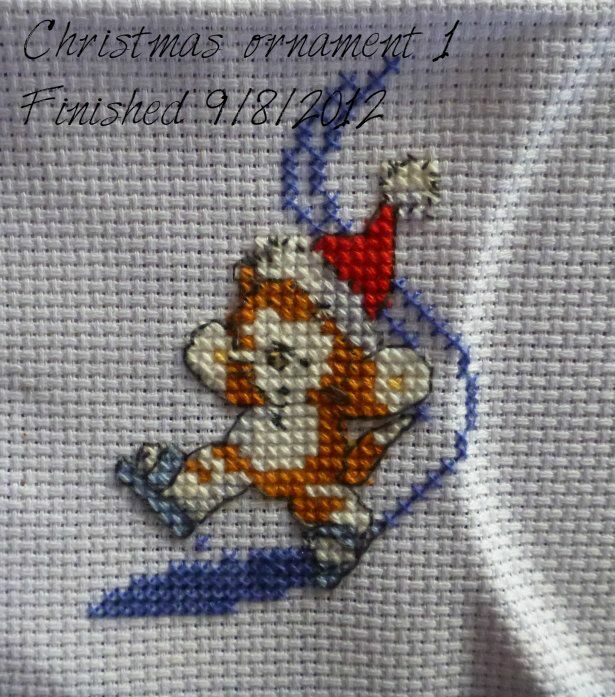 Also I have already started on my Christmas stitching which is great. I am one ornament down ad 20million to go! 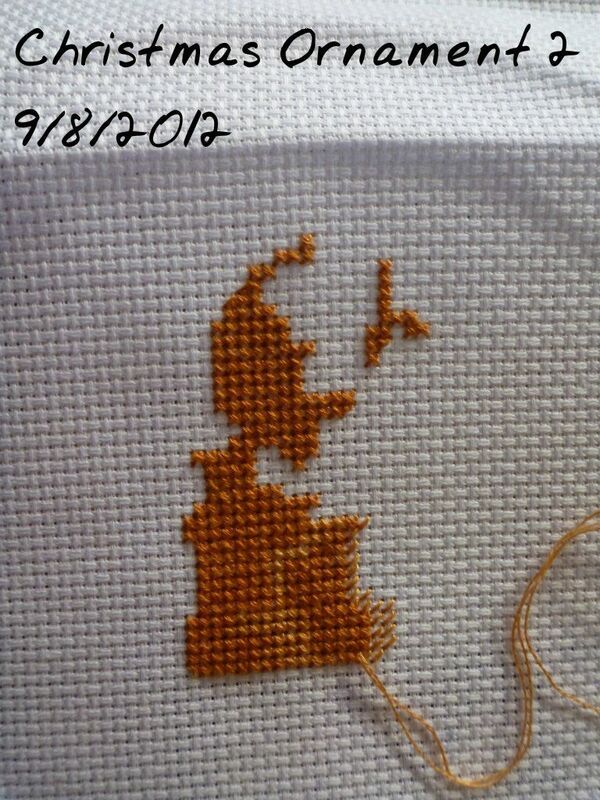 So here is my update only 3 weeks until the next one is due so I had better get stitching. Great stitching. The ornament is very cute. All of those look great! AS always I love seeing more of Tea! Hi Caitlan. I got behind in my blog reading after surgery last week and am catching up but haven't been commenting. Congrats on all the finishes. I love the ornies. Great job on the knitting and crochet toys. Love the chef - I should do one for hubby as that is what he does. Afternoon Tea looks great, the border looks so realistic! 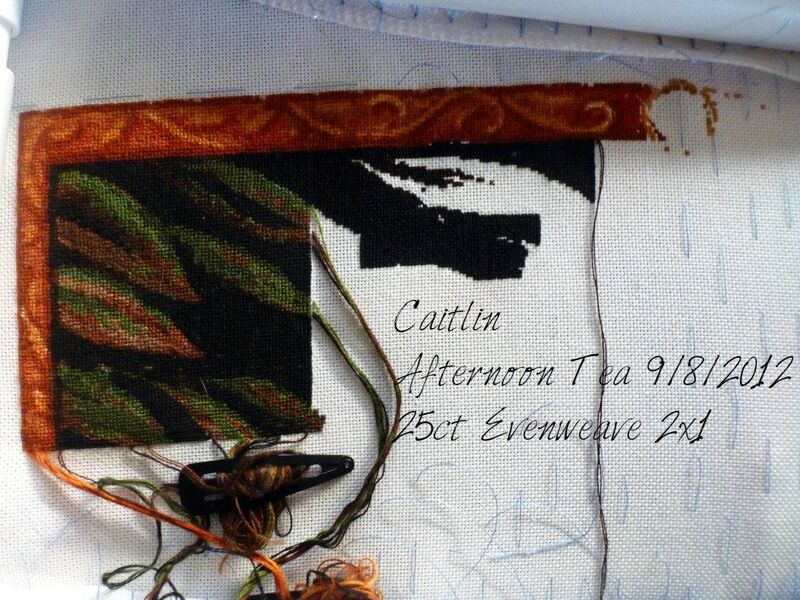 I love how much you have gotten done on your sampler, and the colour works very well with the design. Congrats on finishing your first ornie, I am ashamed to say I haven't even started thinking about X-mas stitching yet, which I know I should, but I just can't get any mojo going for it yet. Looking forward to your next update! Oh, you have already started your ornament stitching. Everey year I plan to do it as well but it never really happens because I'm always distracted by other things. 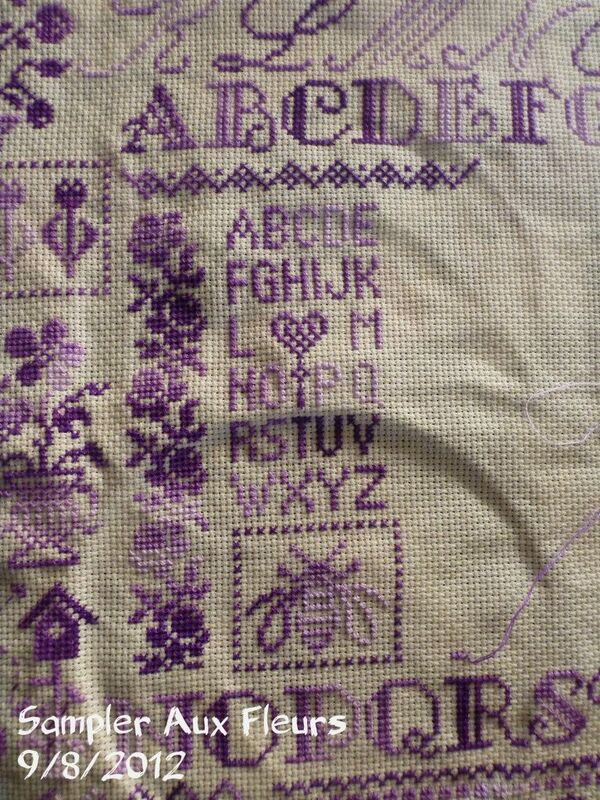 Great progress on the Sampler Aux Fleurs. 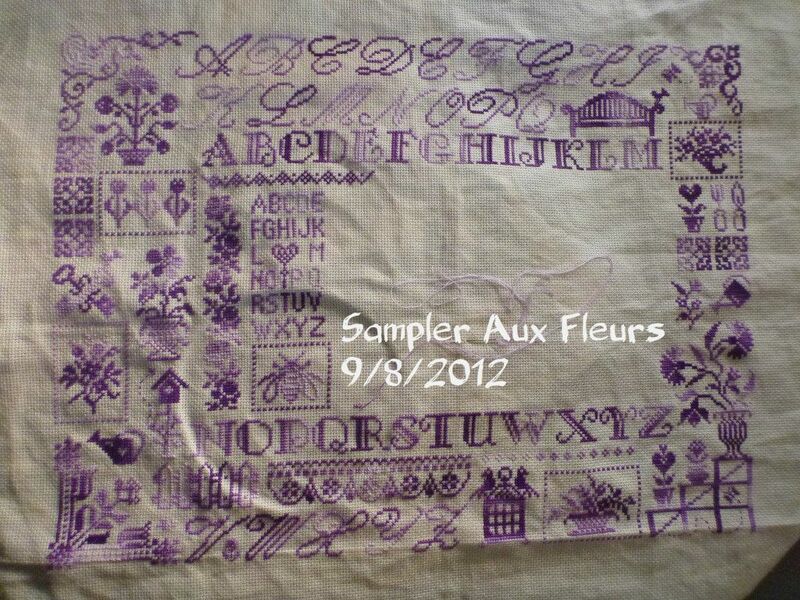 The Sampler aux Fleurs just looks better and better - I look forward to seeing it finished. Having just bought some Spangler charts in the HAED Sale, I shall watch your progress on Afternoon Tea with interest. I know what you mean about slacking off. I'm so behind it's not funny and though I've been reading a lot, my Google Reader still insist of showing that I have 1000+ more post to read. Grrrrr.